Surinam cherries are also known as Pitanga or Brazilian cherry, and originate in Brazil. Now it is found in other parts of the world also. The cherry when ripe is deep red in color. But it undergoes various color changes before attaining the deep red color. Green, yellow and orange are the other colors. Some are bluish red in color when they get ripe. These are sweeter than the dark red cherries. When you touch a ripe cherry, it must fall into your hand. This is how you determine whether the cherry is fully ripe or not. If it does not fall in to your hand, it is not ripe enough to pick. It has a rich flavor and tastes like a mango. It is has tastes of cranberries, tomatoes, bell peppers etc. some say that it has the taste of pineapples, guava, citrus etc. a fully ripe cherry is tastes the best. Many people eat it when it is fully ripe. Black red cherries are the best to taste, although they are rare to find. The taste of Surinam cherries is enhanced when you put in the refrigerator for a few hours. These cherries are known to be rich in the antioxidants beta-cryptoxanthin, lycopene, gamma-carotene, and rubixanthin. When sprinkled with sugar, it releases its juices. It finds common use in jams, ice cream, jellies, and fruit cups. It can also be fermented in to wines, liqueurs, or vinegar. It is a good way to keep your body hydrated, as it contains up to 93% water. The plant’s main stem, the fruit, and the leaves are the medicinal parts of the cherry. Since years, the extracts from its leaves have been in use in Brazilian traditional medicine. The oil you get from the leaves of Surinam cherries are effective as insect repellents and are widely used for this purpose. It contains citronellal, geranyl acetate, geraniol, cineole, terpinene, sesquiterpenes and polyterpenes. The leaves emit a pungent odor when crushed. As such, it is used for throwing on floors as well. Its fruit is very nutritious and has lots of benefits. The health properties of Surinam cherry are attributed to their astringent and antiseptic properties. It is very effective in the treatment of diarrhea and various other gastro-intestinal problems. It is also very effective in preventing common cold because of its high vitamin content. Surinam cherries are rich sources of anti-oxidants and therefore rich in vitamins. These anti-oxidants fight against the free radicals formed in the body and reverse the harmful actions of the free radicals. They also prevent the formation of free radicals in the body, which if formed may cause inflammation and various other diseases. Anti-oxidants reduce the excess oxidation in the body, which may prove harmful for the body. Researches and studies have shown that Surinam can reduce inflammation. Surinam also ensures the normal functioning of the lungs. 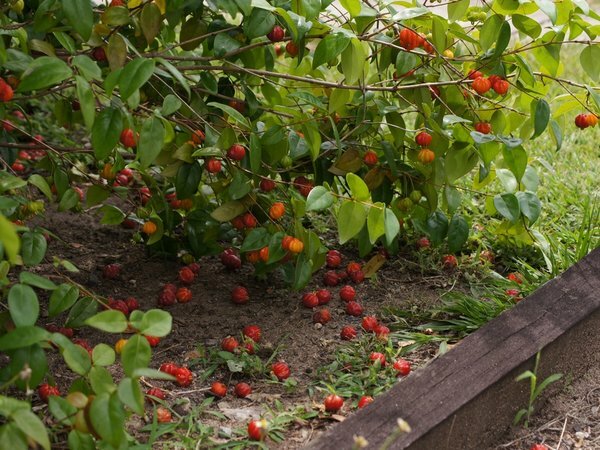 Other than cineole, Surinam cherries also contains proteins, fats, Vitamin C, carbohydrates, calcium, phosphorous, riboflavin, thiamin, iron and niacin. The amount of Vitamin C in it depends on how ripe the fruit is. According to the studies conducted on the cherries, it is said that they contain 93 gm of water. Vitamin B complex is also found in them. They offer the body the energy needed to carry out the daily activities. According to USDA reports, one cup of Surinam cherries consists of 10% fat, 82% carbohydrates and 8% proteins. The content of Vitamin A in the fruit depends on how ripe it is. To serve the fruit, you have to cut it vertically and remove the seeds inside. Now sprinkle some sugar on it and then out it in the refrigerator for 3 to 4 hours. Now it is ready to serve. Surinam cherry is an excellent substitute for strawberry cake. It is also good with whipped cream. When you make fruit salad, you can add these cherries too. Having one cup of Surinam cherries provide you with 5 calories. They are the store houses of vitamins and consuming one of the cherries daily is great for your health. The leaves of the tree are also found to be very helpful. They are known to be effective anti-inflammatory, anti-microbial, and anti-fungal agents. The extracts contain thirty nine compounds. The natural extracts can be used in pharmaceutics, foods, and also cosmetics as they are a potential source of compounds that contain biological activities. The leaf infusion can be taken as an astringent, febrifuge, and stomachic. The decoction of the leaf has been used as an effective remedy against colds. When combined with lemongrass, it is an excellent febrifuge. Boil a pint of cherries with half a cup of water and one and a half cups of sugar. Simmer the fruit in water for about 20 minutes, and then strain the fruit using a sieve. Add sugar to the concoction after re-simmering. You will get a tart, but sweet, sauce. Boil 2 cups of de-seeded cherries along with 2 cups of sugar and a cup of water to make a cherry jam. Blend and strain the cherries to make a punch. For additional flavorings, you could also add key limes, orange juice, or carbonated soda. Use it to sprinkle on salads, custards, or sundaes for additional flavoring. Cook the fruit with pepper, sugar, and star arise in the oven. Stir the concoction and use it as toppings for baked goods. Make wine or vinegar by distilling Surinam cherries. It is a common practice in Brazil. You could also mash the pulp of the cherry and fold it in to baked foods like sweet breads, muffins, or cupcakes. Surinam cherries are tasty, and absolutely healthy. Use them as you wish according to your tastes.